More importantly, new cracks are appearing in the ice shelf that could portend the creation of additional icebergs and the possible destabilization of larger parts of the ice sheet, which holds back land-based ice from flowing into the sea and raising sea levels. Satellite imagery from the Landsat 8 satellite as well as the the camera aboard the European Space Agency's (ESA) Sentinel-1 satellite are helping scientists keep tabs on the gargantuan iceberg despite the shroud of darkness during the Antarctic winter season. Images released by NASA and the ESA show the iceberg's evolution and the beginnings of how the ice shelf is responding to losing such a large piece of itself. According to NASA, the main iceberg, known as A-68A, continues to move northward, away from the Larsen C Ice Shelf. Meanwhile, it has already lost several small chunks. Recent satellite photos also show three small icebergs forming to the north of where the main iceberg had been attached to the ice shelf. 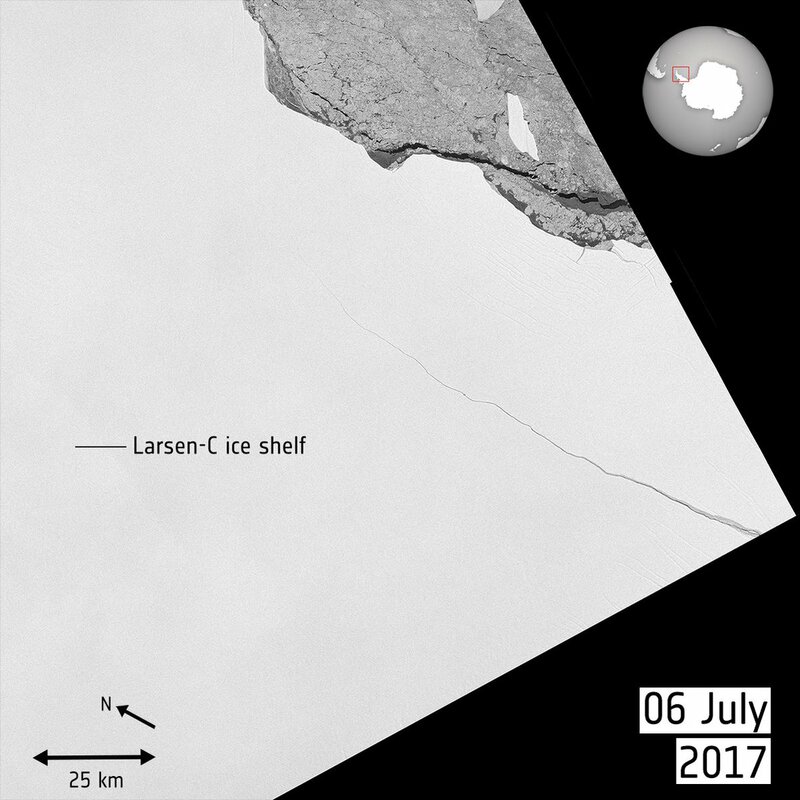 #A68 update: New #Sentinel1 time series 6-24 July: the #iceberg continuing to break up and drift further from #LarcenC ice shelf. If it seems like we're paying unusually close attention to this one particular iceberg, despite the multitude of other icebergs and glaciers that exist worldwide, well, it's because we are. To some extent, we're keeping a close eye on the iceberg because we can. Technology, in the form of advanced satellites, is enabling us to do this in ways that were never before possible. But there's another reason why scientists have their sights set on the Larsen C Ice Shelf. The ice shelf is located in the Antarctic Peninsula, which is one of the most rapidly warming areas of the globe, and two of its neighbors, Larsen A and Larsen B, have already collapsed due in part to human-caused climate change. Because of that, there is tremendous scientific interest in seeing how Larsen C responds to losing about 12 percent of its area in a single, trillion-ton iceberg. While the iceberg calving event itself is not likely caused specifically by climate change, it nevertheless threatens to speed up the already quickening pace of ice melt in the region due in large part to global warming. Scientists have watched since 2014 as a fissure in the ice carved out a slice of the Larsen C Ice Shelf as if someone were taking a giant X-Acto Knife to the ice. That fissure finally set free the approximately 2,400-square-mile iceberg, which has since shrunk slightly in area as pieces have broken off. Researchers affiliated with a U.K.-based initiative, known as Project MIDAS, report that a new rift appears to be developing in the ice shelf that could extend to a higher elevation point, known as the Bawden Ice Rise. That area is considered to be "a crucial point" for stabilizing the ice shelf, and if it were to be weakened in some way it could speed the breakup of the shelf.